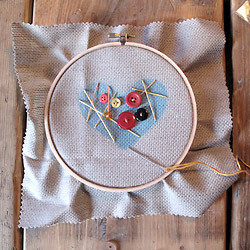 Embroidery, while seemingly simple to adults with sewing experience, can be a tricky skill for children to catch onto. 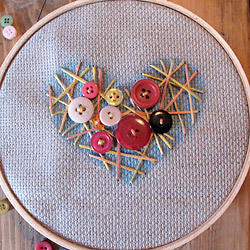 Heart Strung Embroidery has always been a popular project for Moomah children. Though it's been known to occasionally frustrate some and prove the short-attention span of others, it all seems worth it when the repetition of pushing and pulling the needle "through one way and back the other" begins to catch on and flow with ease. The secret beauty of this project is that the sprayed heart already makes the piece, so no matter how over the top, or incredibly minimal the embroidered thread and buttons become, the end product will still be beautiful and recognizable. 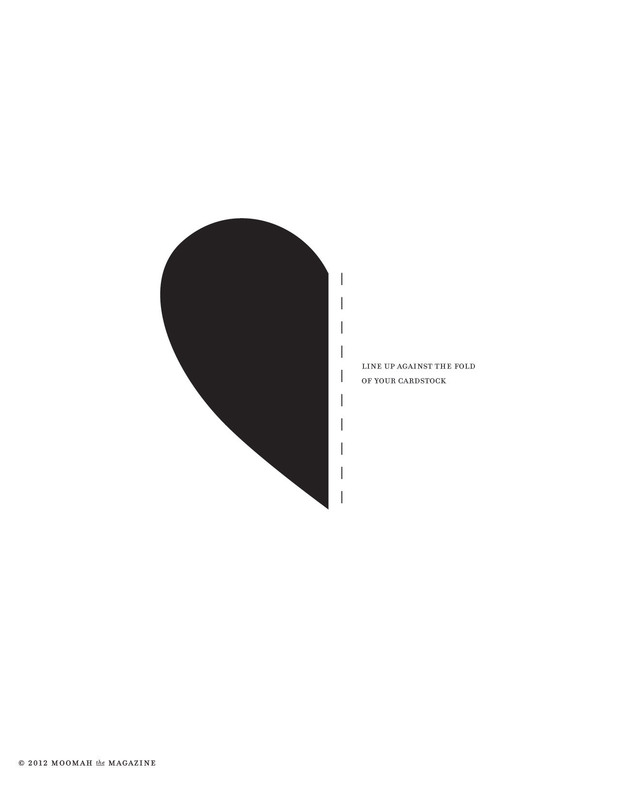 PREPARE your heart stencil by downloading and printing the small heart template. 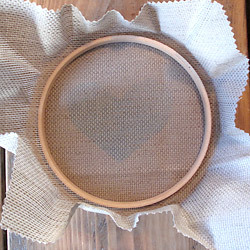 See the Heart Pillow directions for how to create a great stencil. 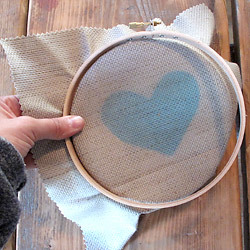 Using spray fabric paint, spray a heart shape onto the middle of the fabric using your heart stencil. We chose blue paint, but any color will work. Allow the fabric paint to dry thoroughly before proceeding to the next step. 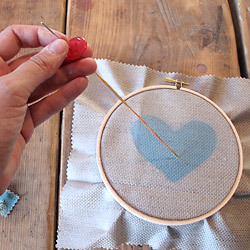 USE the embroidery hoop to hold and stretch the fabric, ensuring even stitching and preventing distortion. 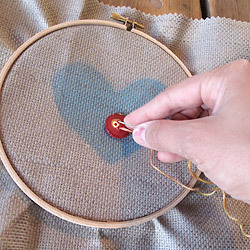 Make sure that the painted heart is in the center of the embroidery hoop. 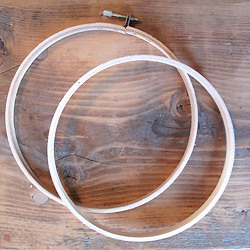 When your fabric is secure, tighten the hoops together with the little gold screw at the top, so the fabric is tight. 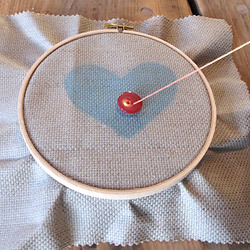 THREAD your needle and make a big knot at the opposite end of your needle to secure the thread. POKE your needle through the back of the fabric, pulling the thread to the front until it stops. Be sure to start the sewing from the back as you do not want your knot showing up on the front side. Keep sewing from front to back. 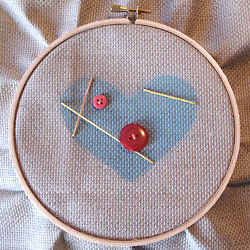 DROP buttons onto your needle and thread as you sew, creating whatever pattern you desire. When sewing a button, be sure to sew through the button holes instead of directly onto the fabric, this will make sure the buttons are firmly secured onto the fabric and are not loose. CONTINUE sewing your thread until you are satisfied with the look. Be sure that the final sew ends with the needle pulling towards the back of the fabric. When you remove the needle, tie another big knot in the thread to secure it and ensure all of your sewing doesn't unravel. The knot should be at the back of your embroidered piece. ENJOY your new embroidered work of art. Keep it in the wooden hoop or transfer it to a frame for display. Bring love to any room with hand-made decorative pillows.